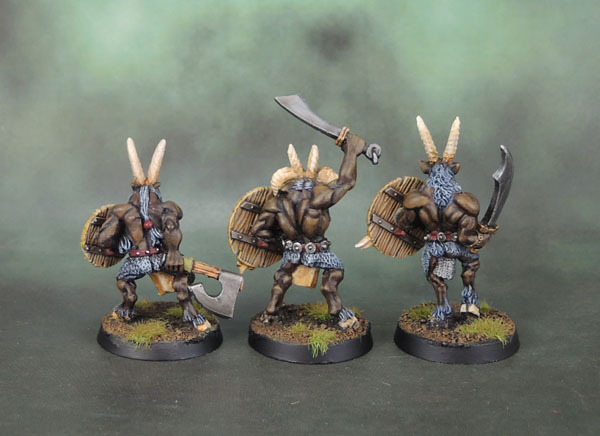 Citadel Chaos Beastmen Gors (Michael Perry, 1995-6) | Azazel's Bitz Box. This entry was posted in Age of Sigmar, Chaos, Realm of Chaos, Warhammer Fantasy - 9th Age and tagged Citadel Beastmen, Michael Perry. Bookmark the permalink. It can go like that but you’ll soon get your mojo back my friend. These look great by the way. Thanks mate. Allowing myself to paint (and finish) random stuff like these guys has been helping a fair bit. One of the most awesome minis range. Chariots, ungors, gors, bestigors, characters, everything la incredible … and before in V5… 2 wounds ! I have a massive army of them, love my un beastmen ! I think these look great! They’ve got quite a presence about them, maybe more than bigger minis might have! And I’d bet that even though you don’t feel like you’ve got much done recently, you’d be surprised at how much further on you’ve got! If I’d only painted this three minis in April I’d have been well pleased! Well, I’m only on 10 completed models for this month, which is more than a bit shy of the 30(+) I’d have liked to have done. Then again, there’s still 4 days left, so I’ll see what I can pull out over the weekend. Great looking models and nicely painted skin. The metal too, your metal technique never gets old. I think it’s mainly due to the well balanced lighting. Nice shadows, but not overly dark like a dry brush, and not too bright and shiny either. And perfect timing for painting some Beastmen, as the Chaos team for Blood Bowl should be up for preorder soon! Thanks mate. I need to get that simple tutorial up sometime, though in my defence I haven’t had a particularly good model around in the queue to use as an example. Just ordered the Chaos Chosen team myself last night. I think I’ll have to replace the heads on the Warriors, though! No worries on the tutorial, I just like looking at the “shiny stuff”! Nice, I preordered the Chaos Chosen team too. I might end up buying some Willy Miniatures Chaos Warriors to replace the ones in the GW box. Will see. 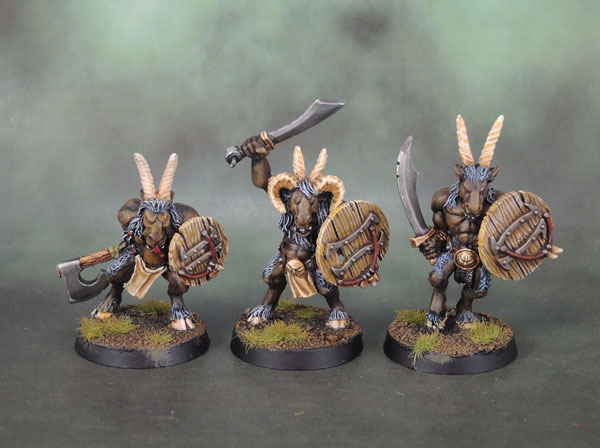 The Beastmen look really sweet. Great work on the trio. The shields are a great addition – they’re far more detailed than their plain counterparts, and having detailed models obscured by boring plain discs is a shame. Yeah, I could easily have (and would have) freehanded something on the plain shields, but these ones really say “beastman” much more effectively. I’ll still use traditional old-school shields with painted designs on my Realm of Chaos Beastmen, since overt chaos symbols fit those ones much more. Great stuff as always. Love the ranges from that time. Not just for the nostalgia but for the simple details, nothing too busy or crowded on them. Yeah, they’re a great balance of detail and space. Though some of them really started to jump the shark as well, particularly on the tail end of that era. I was unfamiliar with this range, nice job on these! Gotta love Beastmen. Thanks Mark. 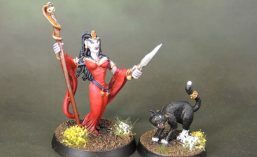 One of my favourite ranges of fantasy figures ever, and one that to my shame I’ve painted very few of to date. Pingback: Reaper 14207: Traeg, Reven Hero/Beastman Champion (Neglected Model September ’18) | Azazel's Bitz Box.